Tomas Verner (21) of the Czech Republic performs his long program to music from the Crouching Tiger, Hidden Dragon soundtrack. Skating first among the leaders, Tomas Verner from the Czech Republic put his rivals into a difficult position with a nearly clean performance. The 2007 European silver medalist opened his program with a quad toe loop, but he touched down slightly with his hand on the landing. He quickly recovered to land all other jumping passes, including a triple Axel in the second half of the program, two triple flips (both in combination), and a triple Lutz, loop and Salchow. Verner’s only mistakes were popping a planned double Axel and a minor stumble at the entry into the final spin, from which he quickly recovered. 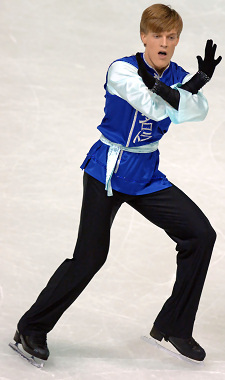 The 2007 NHK Trophy silver medalist received a level 3 for the element and his other non-jumping elements were equally complex. The defending silver medalist also did a great job interpreting his routine to music from the Crouching Tiger, Hidden Dragon soundtrack, capturing the smooth style of movement typical for martial arts. Though he visibly tired towards the end of the performance, the Czech champion never abandoned his choreography, and placed first in the long with 153.72 (75.92/77.72) points and overall (232.67 points). Verner later told the press that he fought until then. Verner also attributed his improvement over the past couple of seasons to hard work, good health, and hitting rock bottom. No less than two dozen fans with huge cowbells came to Dom Sportova to support Switzerland’s Stephane Lambiel, and the audience exploded every time the skater landed a jump. Overall, his long program to Poetica by Vicente Amigo made a strong impression, but his jumping content wasn’t good enough to catch up with Verner. The 2007-08 Grand Prix Final champion opened his routine with a double Axel and a quad toe-double toe-double loop combination. However, he then substituted a second planned quad with a triple flip-triple toe combination, in which he stepped out of the first jump. He also underrotated the second jump in a triple Lutz-triple toe combination, and doubled his second flip. However, the current World bronze medalist’s spins and steps were as good as usual, and his choreography was unmatched by anyone – both in terms of complexity and expressing the character of the music, but the technical score was simply too low. He scored 153.46 (73.46/80.00) points for a second place finish in the long program and overall (225.24 points). Russia’s Sergei Voronov, who stood in sixth after the short program, pulled up to fourth place overall (210.13 points) after placing third in the long with 145.87 (74.03/71.84) points. The current Junior Worlds bronze medalist was flawless in his “Tango” routine. He has also upgraded his jump content since his previous events as he went for the triple flip. Voronov opened his program with a strong quad toe loop, triple Axel, and triple Axel-double toe combination, and went on to land four more triples. The 2008 Russian champion’s non-jumping elements, however, were not as good as those of top skaters. He only earned a level 2 on his flying sit spin and straightline step sequence, however, he set a new personal best in his long program, and his fourth place – combined with Andrei Lutai’s 8th – was just enough to earn Russia three spots for next year. Brian Joubert of France finished third overall (225.24 points), despite a fourth place finish in the long program with 144.20 (70.30/74.90) points. The current World champion, who admitted that he still suffers from residual effects of a virus infection he had in autumn, was obviously exhausted and made mistakes on most of his jumps. He turned out of an opening quad toe loop landing, put a hand down on the first triple Axel, and fell on the second triple Axel attempt. He kept his long to a medley of Metallica’s music (performed by Apocalyptica), but his skating in Zagreb was a pale shadow of the powerful performances he gave last season. The French champion later told the press that it was difficult being in third place. Opening the final flight of skaters, last year’s bronze medalist Kevin Van der Perren of Belgium slipped to fifth place (199.57 points) after he made serious mistakes in the first minute of his Lawrence of Arabia routine. He went down on quad toe loop attempt and singled a planned triple Axel, before pulling himself together to land seven more triple jumps. The 2007-08 Grand Prix finalist also had a stumble on his change of foot upright spin, and overall his program seemed empty and lifeless compared to the performances of the top skaters. He placed sixth in the long with 133.24 (69.18/65.06) points. Van der Perren plans to have surgery in April. He continues to have back pain as a result of a hip injury from a fall at 2005 NHK Trophy. Sweden’s Adrian Schultheiss, who stood in eighth after the short, was the surprise of the competition. The 2007 Golden Spin silver medalist finished sixth overall (184.94 points) – a spot ahead of his more experienced teammate Kristoffer Berntsson. This is a major success for the skater who was only 14th at last year’s World Junior Championships. The 19-year-old had to fight for the landing of his opening triple Axel, and he later popped a loop into double, but managed six more triples and four level 4 spins. He earned a new personal best of 121.54 (64.54/57.00) points for is routine to music from the Mr. and Mrs. Smith soundtrack. As a result, Sweden can now send three skaters to the 2009 European Championships. The event continues with the Ladies Short Program and the Free Dance.